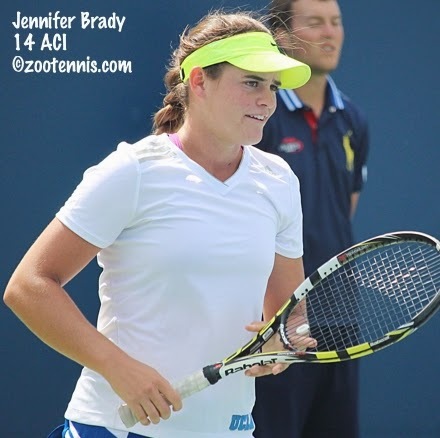 UCLA sophomore Jennifer Brady has been winning with regularity on the USTA Pro Circuit this fall after deciding not to attend school during that time. After winning a $25,000 tournament in Redding last month and reaching the quarterfinals of the $50,000 tournament in Las Vegas, Brady has advanced to the semifinals of the $50,000 event in New Braunfels Texas. The unseeded 19-year-old defeated No. 2 seed Grace Min 7-5, 6-2 today and will play 18-year-old Mayo Hibi of Japan, also unseeded, in the semifinals. Brady lost in the first round in Macon last week, so she had no points in the USTA's Australian Open wild card challenge coming into this week, but she can put herself in the conversation with a victory tomorrow. Min leads the race, with Irina Falconi second and Julia Boserup tied for third. Falconi and Boserup play in the other semifinal Saturday. The final tournament with results counting for the wild card challenge (for women) is next week in Florida. There's another $50,000 tournament in North America with US semifinalists in Toronto, where 18-year-old Taylor Townsend and former USC All-American Maria Sanchez meet on Saturday for a place in the final. Townsend, the top seed, beat No. 5 seed Julia Glushko of Israel 6-1, 6-1 today, while the unseeded Sanchez advanced to the semifinals when No. 3 seed Romina Oprandi of Switzerland retired trailing 6-2. Sanchez and Townsend have met once, last year on grass, with Sanchez posting a 6-3, 6-3 victory. US Open girls champion Marie Bouzkova of the Czech Republic, who qualified, fell in the quarterfinals today, losing to Tatiana Maria of Germany 6-4, 6-4. Maria will play No. 8 seed Gabriela Dabrowski of Canada, who defeated Caitlin Whoriskey(Tennessee) 7-6(6), 6-3. All four singles semifinalists were featured in the doubles final today, with No. 2 seeds Townsend and Sanchez beating No. 1 seeds Dabrowski and Maria 7-5, 4-6, 15-13. It's Townsend's third doubles title on the ITF Women's Circuit, the previous two with Asia Muhammad in $50,000 tournaments earlier this year. At the $50,000 ATP Challenger in Traralgon Australia, three former college stars have reached the final four, with Tennessee's JP Smith facing Stanford's Bradley Klahn in one semifinal and Virginia's Jarmere Jenkins taking on Hiroki Moriya of Japan. Jenkins and Mitchell Krueger have also advanced to the doubles final. The finals are set for the ITF Grade 4 in Atlanta with 2013 champion Kennedy Shaffer facing 13-year-old Abigail Desiatnikov for the girls title and Sam Riffice meeting McClain Kessler for the boys title. Kessler, the No. 14 seed, beat top seed Emil Reinberg 6-7(5), 6-4, 6-3 after losing to Reinberg in three sets last week in the USTA Masters semifinals. Riffice, the No. 3 seed beat fellow 15-year-old Vasil Kirkov the No. 9 seed, 6-3, 6-3 in today's semifinals. Riffice is looking for his second ITF Grade 4 title, after winning Wichita Falls earlier this month. Kessler had not gone past the quarterfinals in an ITF event before this week. The unseeded Shaffer defeated current Les Petits As champion Bianca Andreescu of Canada, also unseeded, 6-1, 7-5 in today's semifinal. No. 15 seed Desiatnikov outlasted No. 5 seed Alexandra Sanford 2-6, 6-2, 7-5. Desiatnikov reached the final of the Waco ITF in September, losing to Kylie McKenzie. At an ITF Grade 5 in Bolivia, two young Americans made the trip to La Paz, which, at over 11,000 feet, is one of the highest altitudes in the world for any habitation and certainly for a tennis tournament. Fourteen-year-old Brian Shi made the quarterfinals and 15-year-old Katie LaFrance reached the doubles final while coping with conditions they are not likely to encounter again. The United States will send another strong team to the annual Master'U BNP Paribas international collegiate competition next month in France, aiming for its fourth consecutive title. Eight teams from around the world play singles, doubles and mixed doubles in a team competition that begins December 4 in Rennes, France. Last year the US team of Peter Kobelt, Marcos Giron, Mitchell Frank, Robin Anderson, Lauren Herring and Sabrina Santamaria defeated Russia 7-0 in the final. The coaches for the 2013 US team--Amanda Augustus of Cal and Greg Patton of Boise State--return again this year, but only Anderson will be returning to France this year. The women's team is Anderson and Chanelle Van Nguyen of UCLA and Julia Elbaba of Virginia. The men's team is Noah Rubin of Wake Forest, Thai Kwiatkowski of Virginia and Nathan Pasha of Georgia. For more on last year's win and Patton's blog, see the USTA website. Speaking of USTA websites, Wayne Bryan has provided his thoughts on where USTA Player Development needs to go from here recently on the USTA Florida website, something of a unexpected outlet for it to surface given its content. Back in early 2012, Bryan called for the end of USTA Player Development in this letter, I responded here, and he responded to my response here. Patrick McEnroe responded to Bryan's letter here, and Bryan responded to McEnroe's response here. Bryan is still advocating for the dismantling of Player Development (I'm not sure when why it's now Professional Development as it's called in the post), is still advocating the private sector for coaching and is still against college scholarships for international players and the 10-and-under tennis mandate. But although I still find some of his statements to be exaggerated for effect (we currently have 12 women in the Top 100, which is four more than any other country and far from the fewest ever) and I don't agree with him philosophically on the issue of international players in college tennis, I can't say I disagree with most of his points in the If we’re going to move forward with USTA PD we need to: section. Here's what I wrote on the topic last month. As we get closer to a new General Manager of Player Development and a new president and CEO of the USTA, I appreciate that Bryan is keeping the topic on the front burner. The acceptances for the Metropolia Orange Bowl were released today, with the initial girls field an exceptionally strong one. The top three girls in the ITF Junior rankings--Shilin Xu of China, CiCi Bellis and Wimbledon girls champion Jelena Ostapenko of Latvia--have all entered, as has US Open girls champion Marie Bouzkova of the Czech Republic. In addition to Bellis, other US girls in the main draw are Raveena Kingsley, Usue Arconada, 2013 Orange Bowl semifinalist Sonya Kenin, Dasha Ivanova, Michaela Gordon, Jessica Ho and Mia Horvit. Tornado Alicia Black is not entered, although she could always request a wild card should she decide to play. Although both are still age-eligible, neither of last year's finalists--champion Varvara Flink of Russia and Ivana Jorovic of Serbia--has entered. Two years ago the Orange Bowl results decided the ITF World Junior champion, with Taylor Townsend clinching it there, and this year's champion could also come down to the 2014 calendar's last Grade A. This feature on Xu from China Daily says she is scheduled to play the Eddie Herr (although that tournament is a week earlier, the entry deadline is a week later than the Orange Bowl) and will also be defending her singles and doubles titles at the Grade B1 in Korea next month. Xu is not entered in the Abierto Juvenil Grade A in Mexico City next month however, so Bellis can gain ground there, but as of right now there are way too many tournaments left to even speculate that the top spot will come down to those two players. But it does make for an interesting six weeks coming up. Current boys No. 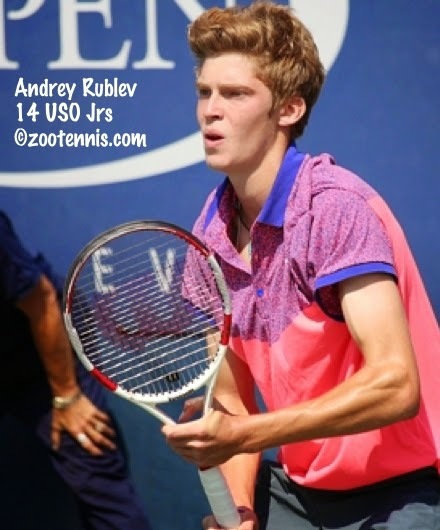 1 is Andrey Rublev of Russia, and he is entered in both upcoming Grade As. 2013 Orange Bowl finalist Stefan Kozlov, a frequent doubles partner of Rublev, is now No. 4 in the ITF rankings and he is entered only in the Orange Bowl. Rublev, who won the French this year, is the only junior slam champion in the field, with Alexander Zverev of Germany, Noah Rubin and Omar Jasika of Australia not playing. Defending champion Francis Tiafoe is also not entered in either Grade A, so his current ITF ranking of 7 will drop. Rublev is not defending any points the rest of the year except in doubles, so he is in the good position to retain the top spot. Other US boys who received direct acceptance into the Orange Bowl are Taylor Fritz, Michael Mmoh, Alex Rybakov, Henrik Wiersholm, Dennis Uspensky, Sameer Kumar, Reilly Opelka, William Blumberg and Kalman Boyd. The USTA Collegiate Clay Court Invitational begins tomorrow in Orlando, with live streaming available at ESPN3 beginning at 8 a.m. There is no streaming for Friday and Saturday's matches, but the coverage will return for the finals on Sunday. Clemson's Hunter Harrington and Miami's Stephanie Wagner are the top seeds. See the Florida State page for links to the draws with match times. Labels: College Tennis, International Tournaments, ITA, ITF Grade A Tournaments, Junior Profiles Non-U.S. The complete fields for next week's USTA/ITA Indoor Intercollegiate Championships at the USTA Billie Jean King National Tennis Center in New York were released today. 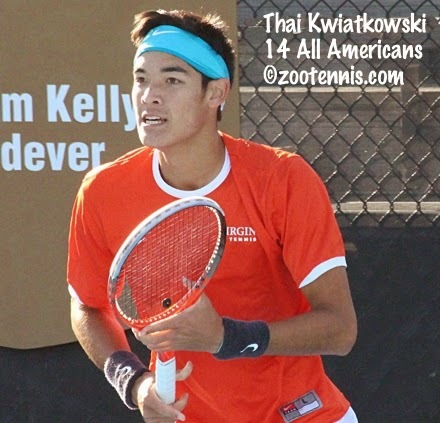 Many of the participants were already known based on the results of the ITA All-American Championships and the USTA/ITA Regional Championships, but there are wild cards and at-large bids added. The doubles teams participating can be found at the ITA website. Two notable women who qualified for the Indoor are not playing: Northwest regional winner Carol Zhao of Stanford and All-American winner Robin Anderson of UCLA. 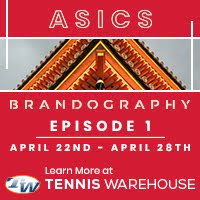 Anderson, who won the Indoor in 2012, is not injured, as she received a wild card into the $50,000 Pro Circuit event this week in New Braunfels, Texas and plays her first round match against Irina Falconi on Wednesday. Speaking of New Braunfels, Julia Elbaba of Virginia qualified into the main draw, defeating former WTA No. 7 Nicole Vaidisova of the Czech Republic 4-6, 6-4, 6-3 in today's final round of qualifying. Former Stanford star Kristie Ahn also earned a place in the main draw with a 6-2, 6-1 win over Katerina Stewart. I will not be going to the Indoor for the first time since 2003 because it is being played in the no-ad format. The blog Chalk Flew Up conducted a poll earlier this month to gauge the support among those outside the college tennis coaching community and those results are available. Although it is a small sample size of just 58, nearly 75% of those taking the poll are against the no-ad format. In addition to the poll, the post also includes comments from some of the respondents. Elias Ymer, the 18-year-old from Sweden, was once again a Davis Cup hero this past weekend, winning the fifth rubber against Latvia to keep his country in the Europe/Africa Group 1. 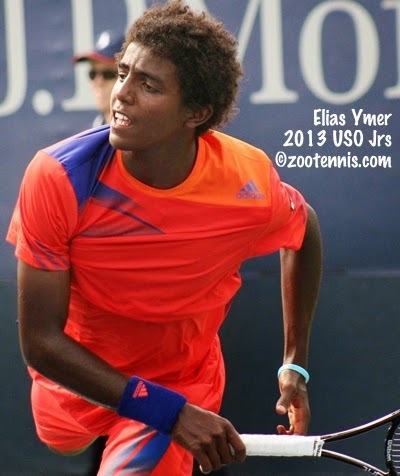 Ymer had also won a fifth rubber last fall against Denmark in another relegation playoff. NCAA doubles champion Mikelis Libietis of Tennessee was on the Latvian team, but saw action only in the doubles match, which Sweden's Robert Lindstedt(Pepperdine) and Johan Brunstrom(SMU) won in five sets. 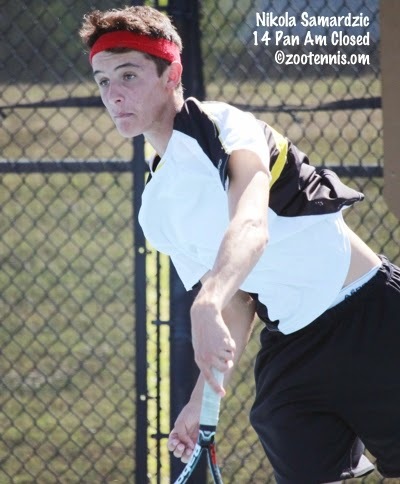 At the Grade 5 tournament in Burlington, Ontario last week, 16-year-old Matthew Gamble of New York won his first ITF junior tournament, having played only one ITF tournament previously--the same tournament last year. The unseeded Gamble defeated second seed, Felix Auger Aliassime of Canada, who is 14, 7-5, 6-0. Gamble had defeated top seed Elijah Ogilvy of Canada in the semifinals. This week the ITF Junior Circuit in the US begins its late fall run at the Grade 4 in Atlanta, with Andie Daniell and Emil Reinberg as the top seeds. 2013 girls champion Kennedy Shaffer is also in the field. Naomi Cavaday of Great Britain had retired, but at age 25, she is returning to tennis. In this article from the Mail, Cavaday describes her struggles with bulimia and depression as she attempted to deal with the pressures of a professional career. In addition to the $10,000 event in Egypt the article mentions, Cavaday just won another $10K tournament last week in Sweden. As I mentioned yesterday, CiCi Bellis has been supplanted at the top of the ITF Junior rankings by Osaka Mayor's Cup champion Shilin Xu of China. But as Jonathan Kelley notes in his weekly post for his On The Rise blog, Bellis is moving up in the WTA rankings after her two $25K titles this month. She is at a career-high 257. Macon finalist Grace Min is also at a career-high of 102. Min leads in the USTA Australian Open wild card race, with the current standing below. The final round of qualifying for the second women's $50K tournament of the three, in New Braunfels Texas, is Tuesday. University of Virginia junior Julia Elbaba and University of Florida freshman Josie Kuhlman are among those still alive for a main draw berth. Anna Tatishvili and Min are the top two seeds. Qualifying was completed today at the first men's Challenger in the Wild Card series, in Charlottesville, Virginia. Kevin King(Georgia Tech), Daniel Nguyen(USC), France's Laurent Lokoli and Denmark's Frederik Nielsen are the four qualifiers. The big news of the day however, was the defaulting of Darian King of Barbados, who angrily slammed his racquet at the back curtain near a line judge after losing a point to Ed Corrie. The line judge went down--in the slow motion it looks like the racquet bounced off the curtain and hit her--and he was immediately defaulted. The video is below. Daniel Rayl, who has committed to Notre Dame for next year, won the Indiana State High School singles title for the second straight year. With Ronnie Schneider winning the title in 2010, 2011 and 2012 and Rayl in 2013 and 2014, Bryan Smith has coached the last five champions. For more on Rayl's victory this year, see this article in the Indianapolis Star. The USTA has announced that the Collegiate Clay Court Championships this weekend in Orlando will again be streamed on ESPN3 and WatchESPN. Times and dates for that streaming can be found here. There is no mention of juniors in the release, so I assume they are not playing this year as they did last year. The Junior Team Tennis 18 and under National Championships were won by the North Richland Hills, Texas(Advanced) and Yardley, Pennsylvania (Intermediate) teams. 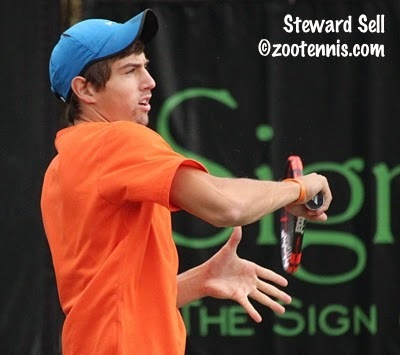 For more on the competition last weekend in South Carolina, see the USTA website. Taylor Fritz gave himself an early birthday present today, capturing his first ITF Grade A title in Japan. The No. 4 seed, who turns 17 on Tuesday, defeated No. 3 seed Yunseong Chung of Korea 7-6(2), 6-3 in the Osaka Mayor's Cup final. Fritz told me in Tulsa that he was playing in Japan for a couple of reasons: to attempt to finish the season in the Top 10, and to play a Grade A on a hard court (he pointed out that Australia, US Open and Osaka are the only Grade A tournaments on the surface, which he prefers to clay, the surface of five of the other six Grade As). With that mission accomplished, he might skip the Grade A next month on clay in Mexico City, although he will still need a good showing at the Orange Bowl to secure a place in the Top 10. Top seed Shilin Xu of China won the girls title, beating No. 3 seed Kimberly Birrell of Australia 7-5, 6-3. If my math is right (a big if), Youth Olympic gold medalist Xu, who also won the doubles title in Osaka, will take over the No. 1 spot in the ITF junior rankings from CiCi Bellis. Last year's Osaka Mayor's Cup winner Michael Mmoh did not defend his title, but can hardly be regretting that after capturing his first Futures title today at the $15,000 tournament in Brownsville, Texas. The 16-year-old Mmoh, a wild card, defeated 2012 Kalamazoo 18s champion Dennis Novikov 7-6(5), 6-1 in the final to become the youngest USTA men's Pro Circuit champion since Rhyne Williams won the Pittsburgh Futures back in 2007. Mmoh was down a break in the first set to the former UCLA star twice, but both times he immediately broke back, including when the third-seeded Novikov was serving for the set at 6-5. In the tiebreaker, Mmoh lost a point on serve to go down a minibreak at 5-3, but hit an ace on the next point. Novikov still had the match on his racquet, but lost both points on his serve and Mmoh closed it out. Mmoh then broke Novikov in the opening game of the second set and that was it. When the 27 ATP ranking points are added in eight days, Mmoh, currently ranked 1433, should be in the 600s. At the $50,000 Macon women's event, qualifier Kateryna Bondarenko of Ukraine defeated No. 4 seed Grace Min 6-4, 7-5 in the final. Madison Brengle and Alexa Glatch won the doubles title, beating Anna Tatishvili and Ashley Weinhold 6-0, 7-5. Qualifying has begun at the $50,000 women's tournament in New Braunfels, Texas, the second leg of the USTA's Australian Open Wild Card Challenge. As I mentioned on Saturday, the men are in Charlottesville for the $50,000 Challenger there, with the final round of qualifying on Monday. A PDF of the qualifying draw is here. The USTA's inaugural Masters event finished today, with Claire Liu and Liam Caruana winning the titles. The 14-year-old Liu, who was entered in the 18s draw and seeded second, beat one of the 16s qualifiers, Victoria Flores, 6-2, 6-2 in the final match. Sixteen-year-old Caruana, the No. 3 seed, defeated No. 4 seed Emil Reinberg 6-0, 6-1 in the final. The Texas recruit lost a total of 11 games in his four victories this weekend. Complete results can be found at the TennisLink site. Sixteen-year-old Michael Mmoh has reached his first Futures final after a dramatic 6-1, 3-6, 7-6(2)win in today's Brownsville semifinals against 18-year-old Deiton Baughman. Mmoh breezed through the first set, but Baughman fought back to force a third. leading most of the way in the final set. With Mmoh serving at 3-5 in the final set, he saved two match points, held and then broke Baughman at love to make it 5-all. After a love hold by Mmoh, who won 12 consecutive points from match point down, Baughman had to hold just to reach the tiebreaker, which he did, after saving a match point at 30-40. Mmoh started the final tiebreaker with an ace and dominated from there to earn his place in the final. Mmoh will meet No. 3 seed Dennis Novikov, the former UCLA star and 2012 Kalamazoo 18s champion, in the final. Novikov defeated top seed Henrique Cunha, the former Duke All-American from Brazil, 6-3, 6-3. Novikov is seeking his third singles title in a $15,000 Futures this year, with the 20-year-old at a career-high of 417 in the ATP rankings. Borna Coric's run in the ATP Swiss Indoors in Basel came to an end at the hands of David Goffin 6-4, 3-6, 6-3, and at the $10,000 ITF women's event in Colombia, qualifier Nicole Frenkel lost to top seed Andrea Koch-Benvenuto of Chile 7-6(1), 6-2. At the $50,000 Women's Pro Circuit tournament in Macon, No. 4 seed Grace Min defeated No. 8 seed Irina Falconi 7-5, 6-3 to advance to the finals. The 20-year-old Min will face former WTA Top 30 player Kateryna Bondarenko of Ukraine, who is coming back to the tour after the birth of a daughter and has been winning a ton of qualifying matches this year, including two this week. The doubles final Sunday in Macon will be between two unseeded American pairs; Ashley Weinhold and Anna Tatishvili against wild cards Alexa Glatch and Madison Brengle. The Macon tournament is the first of the USTA's Australian Open Wild Card Challenge for the women, the men's first opportunity to collect ATP points in the race is this coming week's Charlottesville Challenger. Qualifying began today and continues through Monday. Sam Groth of Australia and Tim Smyczek are the top seeds. Wild cards went to Stefan Kozlov, Ernesto Escobedo, Mitchell Frank and Mac Styslinger. Mmoh won the Osaka Mayor's Cup last year, his first big ITF junior title and Taylor Fritz will be trying to do the same Sunday (later tonight, actually) when the No. 4 seed meets No. 3 seed Yunseong Chung of Korea. Fritz lost his first set of the tournament in the quarterfinals against Seong Chan Hong of Korea but came back for a 5-7, 6-0, 6-4 win and cruised by Corentin Moutet of France 6-1, 6-4 in the semifinals. The girls Osaka final will feature top seed Shilin Xu of China, who has remarkably dropped only one game in four of her five wins (in the second round Xu had a tough 2-6, 6-2, 6-2 win over Emmanuelle Salas of France) and No. 3 seed Kimberly Birrell of Australia. The boys doubles title went to No. 4 seeds Corentin Denolly of France and Johan Nikles of Switzerland, who beat No. 3 seeds Yusuka Takahashi and Jumpei Yamasaki of Japan 6-4, 1-6, 10-4. The girls doubles champions are top seeds Xu and Sara Tomic of Australia, who beat No. 5 seeds Emily Arbuthnott of Great Britain and Emilie Francati of Denmark 6-1, 6-0 (again with that score for Xu). Seventeen-year-old Borna Coric defeated Rafael Nadal today in Basel 6-2, 7-6(4), assuring himself a place in the ATP Top 100 next week. Coric has put together a great year--reaching two ATP quarterfinals, qualifying and winning a round at the US Open, taking a big Challenger title last month--but with this win he has put himself in a rare place. Just how rare Jeff Sackmann of Tennis Abstract details in his tweets this afternoon. After the match Nadal, who admittedly played poorly, particularly in the opening set and in the last few points of the tiebreaker, announced he would not be playing any more this year, missing the Paris Masters and the World Tour Finals in London. In the semifinals, the Croatian will play David Goffin of Belgium, who has lost all of two matches since Wimbledon and today beat No. 4 seed Milos Raonic of Canada 6-7(3), 6-3, 6-4. For more on how Coric, an emotional player as a junior, handled his nerves and the pressure of today's match, see this analysis from the Tennis Island website. Additional coverage is available on the ATP website. Coric, of course, won a US Open junior singles title last year, as did his compatriot Ana Konjuh. The now 16-year-old Konjuh had her signature win back in January, when she beat top seed and WTA No. 14 Roberta Vinci in the first round of the Auckland tournament, and she has also posted three other Top 50 wins this year. She added to that total today, defeating top seed and No. 50 Timea Bacsinszky of Switzerland 6-4, 7-6(3) in the quarterfinals of the $100,000 Challenger in Poitiers, France. Ranked 101 right now, Konjuh is most likely to already be in the main draw of the Australian Open, where she qualified last year, but her performance this week will move her well into the Top 100. At the Brownsville $15,000 Futures, both Deiton Baughman and Michael Mmoh advanced to the semifinals, where they will play each other. Mmoh, who reached the semifinals last week in Mansfield, defeated qualifier Vullnet Tashi of Switzerland 6-1, 7-5 after trailing 4-1 and 5-3 in the second set. Baughman defeated qualifier Tom Jomby(Kentucky) 6-4, 6-1 to reach the first semifinal of his pro career. The top half of the draw has gone according to form, with top seed Henrique Cunha(Duke) facing No. 3 seed Dennis Novikov(UCLA) in that semifinal. At the Macon $50,000 tournament, Irina Falconi(Georgia Tech) and Grace Min picked up wins today, beating Madison Brengle and Sanaz Marand(UNC) respectively, and will play each other in Saturday's semifinal. Min is close to qualifying for the main draw in Australia ranked 117, so with her play this week could get in without having to rely on the USTA's wild card, which is based on performances in two of three tournaments, the first of which is Macon. Nicole Frenkel has reached her first ITF women's circuit final in the $10,000 ITF Women's tournament in Colombia. The 16-year-old left-hander, a qualifier, beat No. 3 seed Victoria Bosio of Argentina 6-2, 4-6, 6-2 in the semifinals and will play top seed Andrea Koch-Benvenuto of Chile in the final. No. 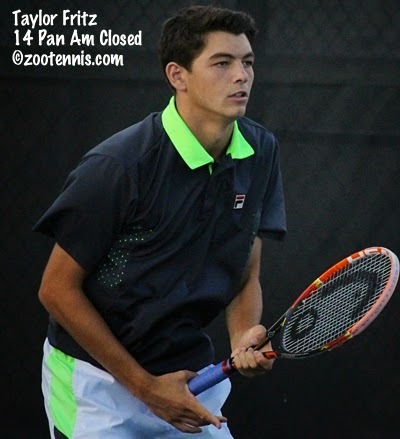 4 seed Taylor Fritz is the sole American junior remaining in the draw at the ITF Grade A Osaka Mayor's Cup. He will play both his quarterfinal and semifinal singles matches on Saturday. Top seed Duck Hee Lee of Korea was upset in the third round by Corentin Moutet of France. Fritz beat No. 13 seed Makoto Ochi of Japan 6-3, 7-5. At the USTA's Masters event in Boca Raton, Blake Croyder and Whitney Osuigwe(a late addition) won the 14s and were given a place in the 16s draw. Osuigwe beat top 16s seed Grace Joyce, but lost to Ally Bojczuk in the second round. Victoria Flores also reached the 18s draw. Croyder also won his first 16s match, but then fell to JJ Wolf, who earned his way into the 18s draw by reaching the 16s final. The 18s draws haven't been posted yet, but will be at the TennisLink site. My contribution to the Tennis Recruiting Network's Fall Signing coverage this month is a piece on Gabby Andrews, who decided ten months ago that she would attend UCLA. I spoke with her about the process and her decision this summer, and for all the the matches I've seen her play since she was 14, I learned much that I didn't know, particularly how she ended up choosing tennis. Great fun to talk to, Andrews is also obviously a phenomenal doubles partner; her coach Barry Friedman told me what makes her so outstanding, although I didn't need any convincing after watching her win so many big titles with a variety of partners. The quarterfinals are set for the $15,000 Brownsville Futures, with 16-year-old Michael Mmoh and 18-year-old Deiton Baughman earning spots in the final eight. Mmoh, a semifinalist at last week's Mansfield Futures, received a wild card this week, and in his first round match Wednesday avenged that semifinal loss to Dimitar Kutrovsky(Texas) 6-3, 6-1. Today he defeated qualifier Antoine Richard of Canada 6-4, 6-2. 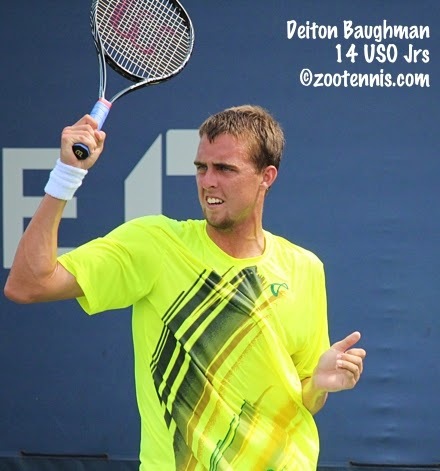 Baughman, who has reached a Futures quarterfinal three times before this week, defeated No. 4 seed Fritz Wolmarans of South Africa 7-5, 6-3 in the first round and today downed Mico Santiago 6-3, 6-3. He will play former University of Kentucky standout Tom Jomby, a qualifier, for a place in his first Futures semifinal. At the $10,000 ITF Women's Circuit event in Colombia, 16-year-old qualifier Nicole Frenkel has reached her second career pro semifinal. Frenkel, now training at the JTCC in College Park, beat fellow JTCC student Usue Arconada 4-6, 7-6(3), 6-1 in today's quarterfinals. Seventeen-year-old Borna Coric of Croatia reached his second ATP quarterfinal of the year, his first at a 500-level tournament, with a 6-4, 6-4 win over Andrey Golubev of Kazakhstan. He will now face Rafael Nadal in the quarterfinals. According to Josh Meiseles of the ATP, Coric is the youngest player to make two ATP quarterfinals since Nadal in 2003. 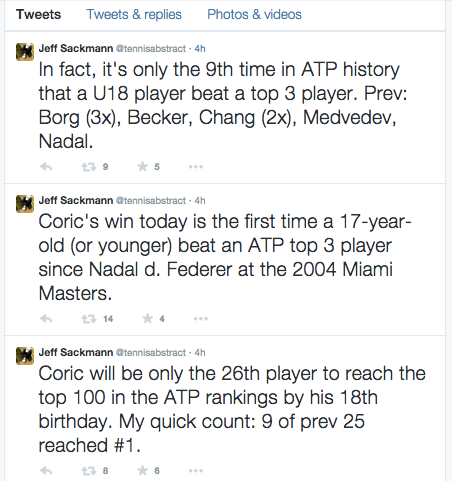 More on Coric from the ATP here. The Macon $50,000 US Pro Circuit tournament is the first one in the USTA's Australian Open wild card challenge, and six US women have reached the quarterfinals: 17-year-old wild card Ellie Halbauer, Madison Brengle(who probably doesn't need the wild card), Sanaz Marand(North Carolina), Julia Boserup, Irina Falconi(Georgia Tech) and Grace Min. There are two more tournaments left, with the best two results counting, so the wild card is a long way from being decided, but with four US women in the bottom half, one is assured of reaching the final this week. Live streaming is available at the USTA website. The acceptance lists for the ITF Grade A Abierto Juvenil Mexicano, which moved from January to November and onto clay were released today and both No. 1s--CiCi Bellis and Andrey Rublev of Russia--have entered. The tournament in Mexico City, which begins Nov. 17, is the first of four consecutive weeks of major clay court events on the ITF junior circuit, with the Grade 1 Yucatan Cup, the Grade 1 Eddie Herr and the Grade A Orange Bowl following it. With the Orange Bowl, the last tournament of the year, ending on December 14th and the first Grade 1 of 2015 not until January 5th, this actually provides something like an off-season, even if only three weeks, and an opportunity to be home for the holidays. Previously, the Abierto Juvenil began around Christmas even though the points counted for the following year. This year's US entries in the girls main draw are: Bellis, Usue Arconada, Michaela Gordon, Olivia Hauger, Jessica Ho, Mia Horvit, Raquel Pedraza and Kelly Chen. US boys in the main draw are: Michael Mmoh, Taylor Fritz, Alex Rybakov, Sameer Kumar, William Blumberg, Kalman Boyd, Ulises Blanch, Nathan Ponwith, Robert Levine, Catalin Mateas and Anudeep Kodali. The complete lists can be found at the ITF junior website. At the current ITF Grade A in Osaka, Japan, rain disrupted the schedule for Wednesday, but No. 4 seed Taylor Fritz did advance to the third round. No. 14 seed Mia Horvit, who did not play her second round match, is the only other American with a chance to reach the third round. Seventeen-year-old wild card Borna Coric of Croatia defeated No. 6 seed Ernests Gulbis of Latvia 7-6(2), 6-3 in the first round of the ATP 500 tournament in Basel, making him the first 17-year-old to win matches in three different tour events in the same year since Rafael Nadal did it in 2003. Coric will play Andrey Golubev of Kazakhstan Thursday for an opportunity to face No. 2 seed Nadal in the quarterfinals. For more on Coric's win, see the ATP website. The ATP website provided a feature on 2014 Australian Open boys champion Alexander Zverev of Germany, who lost today in Basel to No. 5 seed Grigor Dimitrov 2-6, 6-4, 6-2. Zverev, also 17, is expected to join Coric in the next generation of ATP stars, and in the article, Andy Murray and John Isner give their views on his potential. Business Insider regularly updates its readers on who plays tennis with whom on Wall Street, and I believe I posted a link to this article from last year (since updated) on the many former college stars now working in finance in the area. There's another such article today, with video of James Blake, rumored to be in contention for the USTA's General Manager of Player Development vacancy. I missed earlier that former Notre Dame standout Stephen Bass is now a professional poker player and am still trying to determine who is the "extremely tall 22-year-old, who was a former top-ranked NCAA doubles player with a 4.0 GPA at a southern university more known for its football" who has captured investment banker Jeffrey Appel's attention. Any ideas? The USTA/ITA Regional Championships ended today, with the 12 men's and 12 women's singles and doubles champions guaranteeing themselves spots in November's USTA/ITA Indoor Intercollegiate Championships. The remainder of the places in the tournament (32-draw in singles, 20-draw in doubles), will be filled by the ITA All-American consolation winners and men's singles quarterfinalists* and women's singles semifinalists,**, All-American doubles finalists, at-large selections, the small college super bowl champions and wild cards. Those will be announced later on the ITA website. Freshmen Cameron Norrie of TCU, Andrew Watson of Memphis, Tom Fawcett of Stanford and Josie Kuhlman of Florida won regional singles titles as did unseeded newcomer Mikael Torpegaard of Ohio State. Although there are links to most draws at the ITA regional results page, I was not able to determine the seeds in the women's Northeast Regional and in the men's doubles in the Northeast Regional, but have provided them for all other results. Austin Smith(1), Georgia def. Nathan Pasha(2), Georgia 4-2 ret. Brayden Schnur(1), North Carolina def. Jason Tahir(4), Duke 6-3, 6-2. Ryan Shane(2), Virginia def. 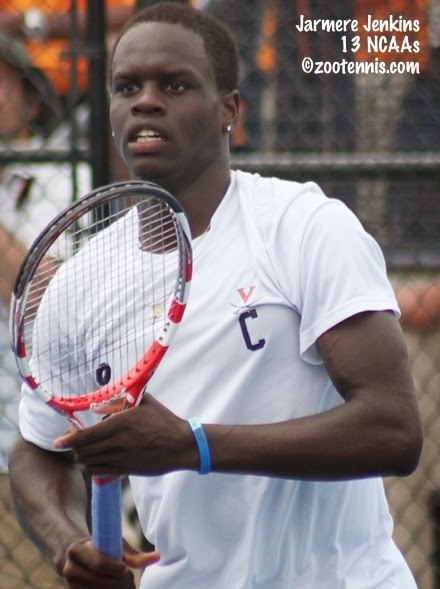 Amerigo Contini(1), Virginia Tech 6-2, 7-6(6). The event, developed from the past model of junior national team training camps, in which the top juniors from around the country would converge for match play and training, will feature a “progressive” tournament format combining 18-and-under, 16-and-under and 14-and-under age groups for boys and girls (The group of 14s will square off first, with the winner advancing to play in the group with 16s. The two top players from the 16s will then progress to play with the 18s). In addition to the clay-court tournament, each junior will have access to the Training Center’s resources, receiving on-court instruction from the USTA national coaching staff, as well as strength and conditioning and mental skills training. Draws and results will be available at the TennisLink site. Today in Valencia, 16-year-old Stefan Kozlov played in his second main draw match on the ATP tour, falling 6-3, 6-3 to Slovakia's Martin Klizan. Klizan, who won the French Open boys title back in 2006, got the first break of the match in the seventh game, and didn't face a break point in the opening set. Kozlov got his first two break points in the opening game of the second set, but Klizan held and eventually took a 4-1 lead in the second set. Kozlov got back on serve with a break at 4-2, but he was broken to give the 25-year-old left-hander an opportunity to serve out the match, which he did. Jeff Sackmann at tennisabstract.com charted the match, and it is available to watch via ESPN3's replay feature. The ATP's Josh Meiseles wrote this feature on Kozlov prior to today's match. The USTA's Australian Open Wild Card Challenge for US women begins this week at the Macon $50,000 tournament. Mirjana Lucic-Baroni of Croatia is the No. 1 seed and one of three WTA Top 100 players in the field. Qualifying doesn't end until Tuesday, but Danielle Lao, the former USC All-American, had a big win in today's second round of qualifying, beating former WTA Top 10 player Nicole Vaidisova of the Czech Republic, who is making a comeback after four years away from the tour. Lao won 6-4, 6-2 and will face Slovenia's Petra Rampre for a place in the main draw. Fifteen-year-old Michaela Gordon is also in the final round of qualifying. Qualifying is complete at the $15,000 Brownsville Futures, with 17-year-old Nikola Samardzic making his main draw Futures debut after failing to qualify in his previous 15 attempts. Sixteen-year-old Michael Mmoh, a semifinalist last week, received a wild card into the main draw, where he will meet No. 2 seed Dimitar Kutrovsky of Bulgaria, who beat him 6-2, 6-4 last week in Mansfield. Henrique Cunha of Brazil is the top seed, with Dennis Novikov No. 3. At the National Junior Tennis League finals in South Carolina, teams from Austin, Texas and Woodstock Georgia won the two divisions in the 14s age group. For more on their victories, see this article from the USTA. Fifteen-year-old CiCi Bellis won her second straight singles title at a $25,000 USTA Pro Circuit event today in Florence, South Carolina. Bellis received a special exemption into the main draw this week based on her inability to play qualifying because she was competing in the final of the Rock Hill tournament. In today's final, Bellis defeated No. 6 seed Ysaline Bonaventure of Belgium 6-2, 6-1, giving her ten straight Pro Circuit victories and 15 wins in a row counting her five at No. 1 singles for the US Junior Fed Cup team late last month. Because Bellis is only 15, she is restricted to just 10 WTA/ITF pro tournaments between April of 2014 and April of 2015, when she turns 16. She has played seven, and will almost certainly receive an additional two tournament entries based on finishing the year in the ITF Junior Top 5, but the restrictions will certainly impact her schedule in the next six months. University of North Carolina sophomore Jamie Loeb and former Tar Heel Sanaz Marand won the doubles title in Florence, with the No. 2 seeds beating No. 3 seeds Keri Wong(Clemson) and Danielle Lao(USC) 6-3, 7-6(5). At the Mansfield Futures, top seed Liam Broady of Great Britain won both titles, beating former Texas Longhorn Dimitar Kutrovsky of Bulgaria 1-6, 7-6(2), 6-0 in the singles final and teaming with Dennis Novikov for the doubles title. Broady and Novikov beat Henrique Cunha(Duke) and Kutrovsky 4-6, 6-3, 10-7. Former Alabama star Saketh Myneni of India won the first Challenger singles title of his pro career today at the $50,000 tournament in Indore, India. The unseeded Myneni, who turns 27 today, beat top seed Aleksandr Nedovyesov(Oklahoma St) of Kazakhstan 6-3, 6-7(4), 6-3 in the final. American participation at the Grade A Osaka Mayor's Cup in Japan is generally not great due to the distance and time of year, but this year there are a number of US juniors in the draws. Taylor Fritz, the No. 4 seed, is joined in the boys draw by Alexander Lebedev, and five US girls are competing: No. 11 seed Raquel Pedraza, No. 14 seed Mia Horvit, Emma Higuchi, Mimi Levine and Jenna Friedel. Horvit reached the semifinals of this week's Grade 2 in Nagoya Japan, losing to top seed Katie Swan of Great Britain. Swan lost to No. 10 seed Chihiro Muramatsu of Japan 3-6, 6-1, 7-6(5) in the final. No. 3 seed Johan Nikles of Switzerland won the boys title, beating unseeded Uosuke Watanuki of Japan 7-6(6), 6-4. Youth Olympic Games gold medalist Shilin Xu of China is the top girls seed, while Duck Hee Lee of Korea is the top boys seed in Osaka. 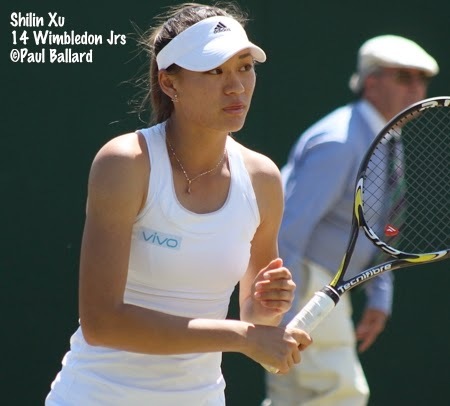 At the ITF Grade 5 in Vancouver Canada this week, two US juniors made the finals. No. 2 seed Sangeet Sridhar lost to Canada's Kyryll Kryvchun, the No. 1 seed, 6-3, 6-2 in the final. Qualifier Alexandra Belaya won her first ITF title, beating unseeded Oleksandra Gorchanyuk of Canada 6-3, 6-3 in the final. I mentioned on my twitter account (@zootennis) Friday that I was at Stowe Stadium to watch the Michigan State High School Division II boys championships. The top two seeds were from the local Portage schools, with senior Steward Sell of Portage Northern No. 1 and freshman Bill Duo of Portage Central No. 2. Duo was the runner-up at this year's USTA Boys 14s Nationals in San Antonio, but obviously is much younger and less experienced than Sell. Both won in less than 40 minutes in the third round matches I watched Friday, and yesterday they met, as expected, in the final at No. 1 singles, with the match played indoors due to rain. Sell won 6-3, 6-4, his fourth victory over Duo this year, to finish his season undefeated. Forest Hills Central ended Midland Dow's impressive five-year winning streak of team titles. For more on Sell and Duo, see this Kalamazoo Gazette article. CiCi Bellis continued her run in South Carolina, with the 15-year-old reaching her second $25,000 Pro Circuit final in as many weeks with a 1-6, 6-4, 6-1 seminial win today over unseeded Petra Rampre in Florence. Bellis, who received direct entry this week due to reaching the final last week in Rock Hill, went down a break 1-0 in the second set after dropping the first, but won four of the next five games for a 4-2 lead. She let that slip, but broke Rampre serving at 4-5 to send the match to a third set, which Bellis dominated. She will play No. 6 seed Ysaline Bonaventure of Belgium in Sunday's final, looking for her tenth straight win. 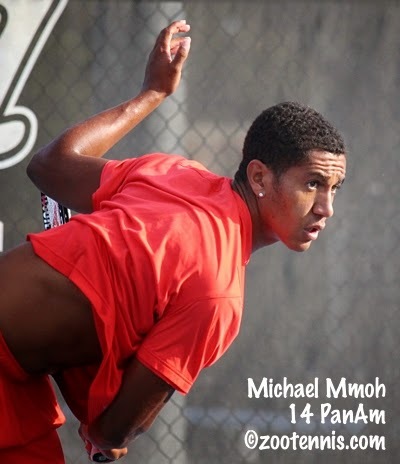 Michael Mmoh's run at the Mansfield Futures ended in today's semifinals, with No. 4 seed Dimitar Kutrovsky(Texas) beating the 16-year-old 6-2, 6-4. Kutrovsky will play top seed Liam Broady in both Sunday finals. He and Henrique Cunha(Duke), the No. 3 seeds, will play Broady and Dennis Novikov(UCLA), the No. 2 seeds, in the doubles final. Stefan Kozlov announced, even before he had reached the Sacramento Challenger final, that he had received a main draw wild card into the ATP 500 tournament next week in Valencia Spain. With the draw released today, the 16-year-old learned he will face unseeded Martin Klizan of Slovakia in his second ATP tour-level match. The 25-year-old Klizan is ranked No. 37. The schedule has not been announced, but the draw is available here. 2013 NCAA finalist Jarmere Jenkins continued his outstanding fall, winning his second straight $15,000 Futures in Australia. This week in Toowoomba, the former Virginia Cavalier, seeded No. 3, beat top seed and two-time junior slam winner Luke Saville of Australia 6-3, 7-5 in the final. He also partnered with Mitchell Krueger for the doubles title, their second in the past three weeks. Jenkins and Krueger, the top seeds, defeated No. 2 seeds Jake Eames and Christopher O'Connell of Australia 6-2, 6-2 in the final. They didn't lose more than four games in any of the eight sets of doubles they played. In other results from the ITF Pro Circuit, Australian Open champion Elizaveta Kulichkova of Russia won her third $25,000 tournament of the year, this one in Thailand. The 18-year-old, seeded fourth, defeated No. 6 seed Lesley Kerkhove of the Netherlands 6-1, 6-0 in the final. And Wimbledon boys semifinalist Johan Sebastien Tatlot of France claimed his second Futures title in two months and third overall at a $10,000 tournament in Italy. Tatlot, the No. 4 seed, beat No. 6 seed Walter Trusendi of Italy 2-6, 7-5, 6-3 in the final. 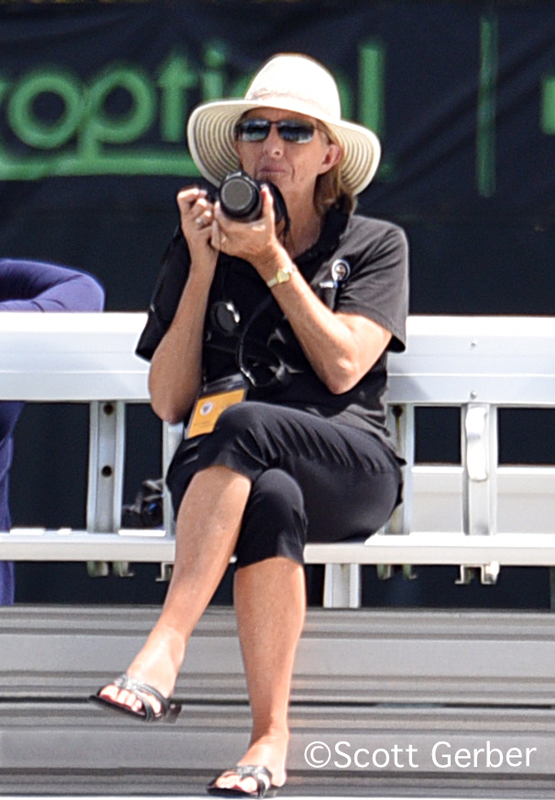 Lisa Stone at Parenting Aces has taken a step to accentuate the positive in junior tennis tournaments, implementing an award for Best Tournament Director. Recognition in that job is tough to come by, so if you have had a good experience at a junior tournament, here's your chance to give feedback that will help provide some. I plan to fill out a nomination myself. The direct link to the nomination form is here. Sixteen-year-old Michael Mmoh reached his first semifinal on the Futures circuit today, defeating University of Oklahoma sophomore Andrew Harris 3-6, 6-2, 6-4 at the $15,000 Mansfield Futures in Texas. Mmoh, a wild card who went straight from winning Saturday's final at the ITF Grade B1 Pan American Closed in Tulsa to Mansfield, is the only surprise semifinalist. Top seed Liam Broady of Great Britain will play No. 3 seed Henrique Cunha(Duke) of Brazil, while Mmoh will take on former Texas All-American Dimitar Kutrovsky of Bulgaria, the No. 4 seed, in the other semifinal Saturday. All those close calls for Mmoh in Tulsa may have helped with his confidence in this week's tournament, the ninth Futures level tournament he has played. CiCi Bellis, who also came away with a champion's trophy last week, hers at the $25K in Rock Hill, has now won eight straight matches in South Carolina. She defeated Duke freshman Samantha Harris 6-2, 6-4 in the quarterfinals of the $25,000 tournament in Florence and the 15-year-old will play 34-year-old Petra Rampre of Slovenia, also unseeded, in the semifinals. Nineteen-year-old Bernarda Pera of the US and No. 6 seed Ysaline Bonaventure of Belgium are in the other semifinal. No. 2 seeds Jamie Loeb and Sanaz Marand(UNC) have reached the doubles final. Next week's Macon, Georgia $50K marks the beginning of the USTA's Australian Open Wild Card Challenge for women, so wild cards into the event are of even greater importance than usual. They were announced yesterday as going to Lauren Embree(Florida), Jennifer Brady(UCLA), Katerina Stewart and Ellie Halbauer. Three ITA Division I regionals were completed last week, but the other 21 are underway right now at sites across the country. I will have a complete list of results for both singles and doubles finals, I hope by next Tuesday, when the last of the regionals are expected to wrap up. In the meantime, you can follow individual draws at the ITA website. I've been following the Stockholm ATP event a little bit closer than usual this week, intrigued by the bottom half which featured three US Open boys champions in the quarterfinals: Bernard Tomic(2009), Grigor Dimitrov(2008) and Jack Sock(2010). Dimitrov beat Sock 5-7, 6-4, 6-3 today to set up a semifinal against Tomic, but all the talk was of these two incredible Dimitrov shots, back-to-back, off bullet returns from Sock. Watch here at the ATP site. My synopsis of last week's ITF Pan American Closed Championships is available today at the Tennis Recruiting Network. After finishing the tournament on Saturday, champion Michael Mmoh went straight to the $15,000 Mansfield Texas Futures, where, after a win over Jeff Dadamo(Texas A&M) today, he has reached the quarterfinals, his second career quarterfinal at a Futures tournament. In addition to Mmoh, three current college players also have reached the quarterfinals: TCU's Cameron Norrie, who beat Dennis Novikov(UCLA) 7-6(5), 1-6, 6-0; Virginia's Mitchell Frank and Oklahoma's Andrew Harris. Pan Am finalist Claire Liu went straight to Florence, South Carolina and, without any rest, won three qualifying matches in the $25,000 tournament there before losing in a third-set tiebreaker yesterday. CiCi Bellis beat No. 5 seed Miharu Imanishi of Japan 6-4, 7-5 to post her seventh straight win at the $25,000-level. Tornado Alicia Black gave a walkover to Greece's Despina Papamichail. Below is the slideshow of the singles quarterfinalists and the doubles semifinalists. Also below are short videos of the four finalists in the championship matches. 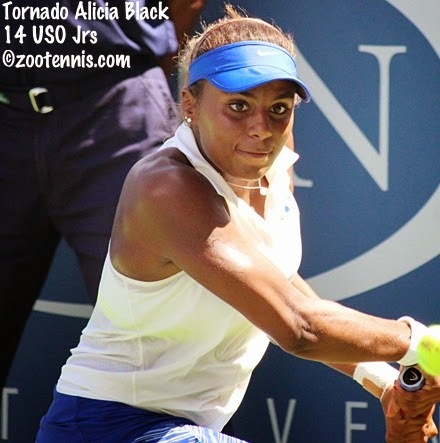 Sixteen-year-old Tornado Alicia Black, competing for the first time since helping the US girls win the ITF's Junior Fed Cup last month, posted the best win of her career today at the $25,000 Pro Circuit event in Florence, South Carolina. Black, who received entry via a junior exemption for finishing in the ITF junior top 10 last year, drew No. 1 seed and wild card Anna Tatishvili, ranked 99 by the WTA. As the No. 1 seed in the $75,000 Albuquerque tournament last month, Tatishvili had beaten Black 6-2, 6-3 in the second round, but Black turned the tables today, taking out Tatishvili by the same score. Black will play qualifier Despina Papamichail of Greece in the second round Thursday. Last week's Rock Hill champion CiCi Bellis, also a member of the US Junior Fed Cup championship team, defeated Katerina Stewart for the second time in two weeks, although this time in straight sets, 6-2, 6-4. Bellis will play No. 5 seed Miharu Imanishi of Japan Thursday. Claire Liu, who qualified with three wins and without a day off from her six days of play as a finalist at the ITF Pan American Closed, fell just short of her first Pro Circuit victory against qualifier Jan Abaza. The 14-year-old, who had qualifying wins over Stephanie Luk, Jamie Loeb and Kennedy Shaffer in her first pro-level tournament, came back to force a third set and actually led 4-2 in the final set, but fell 6-1, 5-7, 7-6(5). Qualifier Samantha Harris, the Duke freshman, also picked up a big win, beating No. 3 seed and WTA No. 134 Sharon Fichman of Canada 4-6, 7-5, 6-3. 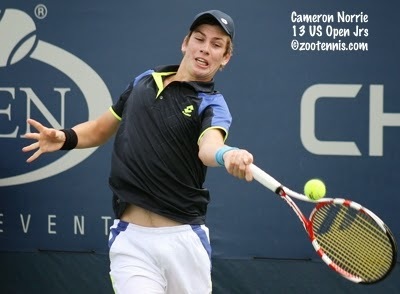 At the $15,000 Futures tournament in Mansfield, Texas, TCU freshman Cameron Norrie, a qualifier, won his first round match over Pavel Krainik of Canada. 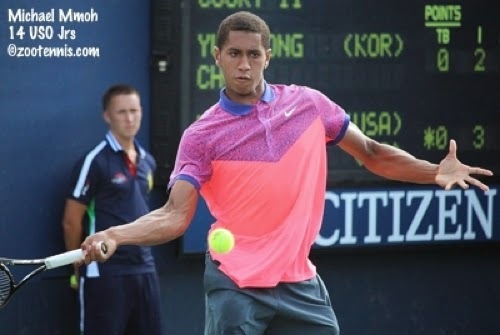 Wild card Michael Mmoh defeated Evan King (Michigan) yesterday in a first round match. Eighteen-year-old Naoki Nakagawa advanced to the second round, as did Virginia senior Mitchell Frank. Oklahoma sophomore Andrew Harris also reached the second round with a win on Tuesday. NCAA champion Danielle Collins of Virginia is featured in the USTA's College Spotlight. Collins talks about her wrist surgery, her transfer from Florida after her freshman year and playing Simona Halep at the US Open. The Telegraph's Simon Briggs provides this detailed look at the changes coming for the LTA under new chief executive Michael Downey, formerly of Tennis Canada. The "ferocious" training sessions conducted by new performance chief Bob Brett may send a message, but asking children to train like professionals has its own consequences, not all of them good. If you believe the lack of "hunger in paradise" is what ails British tennis, this tough love approach may help. If you think, as I do, that the problem is much more complicated than that, you might want a bit more recognition of that from the leadership there. NATION’S TOP TEAMS TO COMPETE AT THE 2014 USTA JUNIOR TEAM TENNIS NATIONAL CHAMPIONSHIPS IN CAYCE, S.C.
WHITE PLAINS, N.Y., October 14, 2014 – The United States Tennis Association (USTA) today announced the 2014 USTA Junior Team Tennis National Championships will be played on October 16-19 for the 14 and Under division and October 23-26 for the 18 and Under division. The tournament, which will be held at the Cayce Tennis and Fitness Center in Cayce, S.C., will feature the top 64 teams from across the U.S., totaling more than 500 participants. The National Championships feature teams that have advanced from the Section level to compete for the title. Each year the USTA crowns a national champion in two age divisions (14U and 18U) in both Intermediate and Advanced play divisions. “The National Championships are the culmination of the Junior Team Tennis season and bring together the best teams from the 17 sections,” said Craig Jones, Director, USTA Junior Play. “Not only is the level of competition incredible, but the kids are treated like royalty throughout the event with free meals, player parties and that famous "Southern Hospitality." This is the third year that the Cayce Tennis Center will host to the USTA Junior Team Tennis National Championships. In addition, a second tennis facility, the Lexington County Tennis Complex, also will be utilized to serve the hundreds of players competing each weekend. Established in 1991, USTA Junior Team Tennis provides youth with all of the health and social benefits of tennis in a co-ed, fun and competitive team environment, and allows participants to compete with and against individuals of similar skill and age levels. With more than 99,000 players competing nationwide, USTA Junior Team Tennis brings players together to enjoy camaraderie and teamwork, providing a fun environment for kids to learn that succeeding is really more about how they play the game—win or lose. Visit the USTA Junior Team Tennis website at ustajtt.com for complete results, stories and photos. 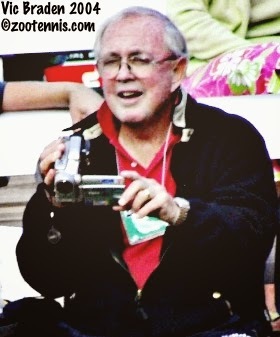 I don't want to let any more time go by before acknowledging the passing of Vic Braden, one of the most important coaches and personalities in tennis, who died last week at age 85. I always say I was drawn to tennis because I grew up in Kalamazoo, home of the USTA 18s and 16s Nationals, but Braden also was an important influence on my love for the game. Although I had little experience with actually playing tennis, I eagerly looked forward to his lessons on PBS. Even if you saw only one, you couldn't help but gravitate to the sport by his inclusive and always funny commentary. It was quite a few years later when I learned Braden was from Michigan and captain of the tennis team here at Kalamazoo College, graduating in 1951. Until the remodeling of the Stowe Tower a few years ago, there was a brass plate that read "Vic Braden Lived Here," a reference to the ball closet where he slept his senior year. I interviewed Braden for the ustaboys.com website back in 2004, when he returned to Kalamazoo for the first time in 40 years to serve as Honorary Referee for the Kalamazoo tournament. He told me how he came to play at Kalamazoo College, and how his job maintaining the then red clay courts made living in the Tower the best option, financially and practically, for him. Braden, who was awarded an honorary doctorate by Kalamazoo College in 2008, brought his omnipresent video camera with him to Kalamazoo in 2004 and for several days filmed juniors and spoke to private and college coaches and the media about his latest research into brain typing. I remember having him tell me that a player's willingness to serve and volley was very nearly genetic. Braden obituaries have come from many different publications, and in a tribute to his vast influence on the game, each one provides a different insight and is worth reading. Steve Tignor provides his usual thoughtful and nuanced look at Braden's career for Tennis.com. Joel Drucker gives his special insight, not only into all that Braden gave to the sport, but what the sport gave to him for Tennis Channel. James Fallows, who took lessons from Braden, wrote this remembrance for the Atlantic, which includes several vintage videos. I have my own vintage Braden, from 2005, when Braden and Jim Martz of Florida Tennis Magazine agreed to let me post on ZooTennis an article of Braden's that had appeared in the magazine the previous month. I'm including it below. I've been spending a great deal of time these last few years trying to determine what makes a champion and whether we can predict that one has the potential to be an international champion. I have had discussions with neuroscientists, brain typists, a tennis playing psychiatrist who has done more than 28,000 brain scans, famous coaches and pro players. The bottom line is that there has been progress in understanding how a champion's brain works, but there are still many unanswered questions. I have to go back to my years of assisting with the management of pro tours. I'm currently archiving 50 years of film, over 30 years of video and about 40 years of audio tapes. I find that today's champions seem to think like the champions from 50 years ago. However, this is not based upon brain scans, but anecdotal records. So, what are the similarities? The champions have had a goal of becoming a big-time winner at a relatively early age. There also was nothing that seemed to be able to deter them from reaching their goal. They were keen analysts when observing the strengths and weaknesses in potential opponents. They seemed to have the ability to analyze their own game accurately. They seemed to be able to analyze quickly when they were getting the right information from coaches. When most players were calling it a day on the practice court, future champions were just getting warmed up. Champions talked more about hating to lose than basking in the glory of victories. The top players seemed to have a unique ability to focus on execution in tight situations rather than worrying about the outcome of the point, or the match. Champions seemed to enjoy the pressure of tiebreakers rather than fearing it. Champions gave away nothing: they would beat an injured player as fast as they could. The ITA Small College Championships in Sumter, South Carolina concluded Sunday with the Small College Super Bowl, which features Division II, NAIA, Junior College and Division III champions playing off for a spot in the upcoming USTA/ITA National Indoor Intercollegiate Championships in New York. The women's champions both defended their 2013 Super Bowl titles; the men crowned a new singles champion, with Armstrong State's Fernando Bogajo taking out defending champion Denis Zmak of Embry-Riddle in the final. Zmak will be returning to New York however, as he defended his doubles title, with a new partner this year. For complete results, see the ITA tournament page. Regionals, which will decide many of the Division I participants, have begun, with most of them scheduled for the upcoming weekend. See the ITA results page to track those results. The USTA announced last week that it was using the Wild Card Challenge format to decide its reciprocal Australian Open wild card this year, rather than using an invitational tournament in Atlanta, as it has done in past years. Similar to the way the French wild card and one US Open wild card are decided, this wild card will hinge on the best two results in three $50,000 challenger tournaments. 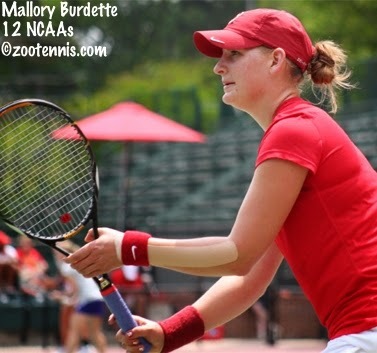 Mallory Burdette, who won the US Open Wild Card Challenge in 2012 and reached the third round, announced last week on Facebook that she would not be returning to the WTA tour after shoulder surgery. I spoke to Burdette at the NCAAs in May, when, as a student at Stanford, she came back to support the Cardinal. She told me she was completing her degree in psychology, but was hoping at that time to come back to pro tennis in 2015. Anyone who saw her play will testify that her ball striking was world class, and facing retirement at 23 seems cruel, but cliched as it sounds, she has so many options as she looks to a new career. A return to tennis as a college coach, should she want that, certainly would be among them. Former University of Illinois All-American Kevin Anderson, now ranked 17 on the ATP computer, is the subject of this feature article on the Illinois athletic site. Anderson discusses how he was recruited to Illinois, the difficult decision to leave after his junior year, his improvement as a pro and his continuing relationship with head coach Brad Dancer and his teammates while at Illinois. "What was really great, as much of an emphasis was placed on improving on the tennis court, I think almost a bigger emphasis was the growth as a person, not just for me, but the whole team, allowing our characters to come through," Anderson said. "It was a lot of character building and I think that's why a lot of the players are still so close to the program and all of us feel that we have a lot of roots that go back to the program. That's a testament to Brad, the program he's put in place, and Craig Tiley as well who was there and did such a great job a decade ago in turning around Illinois tennis. "It's almost funny. I talk to other tennis players from South Africa, especially those who go to college, and always ask if they stay in touch with their college teammates and a lot of them do, but a lot of them aren't as close as when they were back in college. I look back at all my friendships and all of my closest friends are the guys from Illinois. Whenever we're in the same city or town we always get together. At the U.S. Open the last couple years we've had about 10 or 15 people come watch me play, and I think they come to watch me play but they also come to hang out with each other. It's really been special to be a part of that."